In times of Speed-to-Market & Agility we cannot rely on yesterday’s ideas, products and ways of working. Today’s leaders in order to improve performance need to stimulate creative thinking and unleash the creative potential in themselves and in their teams. Creative leaders are more prepared to break with the status quo of industry, enterprise, and revenue models. Attribute Listening (go beyond what is typical). Attribute Listing focuses on the attributes of an object, seeing how each attribute could be improved. Break the product/process into parts, identify ways of improving each of them, and then bring these modification to create a new product/process. Morphological Synthesis. Morphological Synthesis or Analysis uses the same basic technique as Attribute Listing, but is used to create a new product by mixing components in a new way. Meditation. Some people swim or go for a walk. I like going for a walk on my own to the forest next to my house– usually take a note book and a pen and write down the ideas that come to my mind. In the interview Jill answers the questions which of these techniques are her personal favorites, and why? Jill Nemiro: I'd have to pick three, for different reasons. I really love brainstorming because it is a great way to get a team started on the path of coming up with ideas. It is exciting to be a part of a good brainstorming session, because of the synergy and building of ideas that evolves. If these sessions are run correctly, with deferment of judgment of ideas at the onset, then the "sky's the limit" in terms of the kinds of ideas that can be generated. Mind mapping is another favorite technique of mine, because I am a very visual person. I like to see ideas, and how they connect and build on other ideas. A mind-map allows you to see this in a graphic format. And lastly, force-field analysis is a technique that I have used personally to work my way through some difficult challenges. By focusing on a particular challenge, outlining the positive factors pushing you toward the ideal and the negative factors hindering you from that ideal, and then developing actions to strengthen the positive factors and weaken the negative factors, it gives an individual or a team a way to develop concrete action plans to work through challenging situations. Agile teams take “hack” days to promote learning and innovation. Very often teams are encouraged to spend roughly 10 -20 % of their time on “hack” days. During “hack” days people do whatever they want, typically trying out new ideas. Daydream. Interested in creating your dream map? Read my post on this. 1. Join Creative Morning meetings to train your brain! 2. Talk about your ideas – meet inspiring people to change ideas! 3. Every day eat lunch with different person! 4. Be sensitive for beauty – meet new artists and buy artistic/well designed stuff! 5. Stop planning start acting – take part in contests! 6. Accept failures – learn from them and never give up! 7. Everyday do something unusual – do you remember Jim Lawless’ rule 7: Do something scary every day! 8. Create an inspiring environment – for example: decorate one wall in the office with quotations and pictures! 9. Be there is worth being! 10. Take a break – go for a walk! 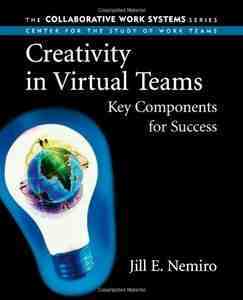 For virtual teams use special designed software programs or interactive whiteboards.